This online resource page includes resources to help set you up for recruiting success. If you’re wondering how to access the Candidate Relationship Management (CRM) portal so that you can start practicing posting jobs and managing candidates, follow the instructions below. *Fun Fact: You can also request your own reset from the site login page (crm.recruiting.com) 24/7! This page! There are a ton of resources on this page that will evolve over time, so it would be a good idea to bookmark this message. Please submit your questions through Karen Wenson. This ensures timely and accurate responses. It also educates our teams as to what additional resources may be required to facilitate your learning experience. There are a few ways to post a job to Jobing.com and/or your Career Site from within the Recruiting.com system. Simply select the 'add job' button (briefcase icon) from the CRM dashboard. You can use Prescreen Questions to test written communication skills, check for other skills and abilities and even see if the job seeker will be a cultural fit within your organization. Prescreen questions can help refine the types of applicants that are applying to your posting and save you time by allowing you to review more targeted resumes. You can (but don’t have to) use up to 10 questions per job posting. ***IMPORTANT NOTE: ALL OWNERS MUST POST A PRE-SCREEN QUESTION ENSURING THE APPLICANTS ARE AWARE THAT THEY ARE APPLYING TO A LOCAL FRANCHISE OF HOODZ. I submit this application to HOODZ of ___________________, and in submitting this application, acknowledge that this location like all HOODZ franchise locations is an independently owned and operated franchise, and understand that each HOODZ location is solely responsible for all employment decisions. Add in prescreen questions asking for candidate to submit their phone number as well as a prescreen question regarding whether they are legally able to work in the US. If you own multiple locations that are geographically close, it is a good idea to vary the titles and job descriptions slightly. Q: How much does it cost to post a job with the Recruiting.com CRM? A: HOODZ has an unlimited posting subscription with Recruiting.com, so there is no direct fee for franchise owners to post on Recruiting.com. Q: What job boards does Recruiting.com work with? A: We post your jobs on Jobing.com as well as send a feed of our jobs to Indeed.com in the wee hours of the morning Monday - Friday. If you have had success with other job boards in the past, such as Craigslist, we encourage you to continue those activities. Q: Do I have to post my jobs in Spanish? A: Short answer is no, you don’t have to post your jobs in Spanish. Some owners may write an English and Spanish version of their job postings to ensure ample coverage. Q: Do you offer translation services? A: No, Recruiting.com does not offer translation services. Q: How can I increase the reach of my recruiting ads? A: In addition to posting on your preferred job boards, it is recommended that you add careers.hoodzinternational.com to anything and everything! Promote in your collateral, your email signature, posters, business cards, and more. Q: How do I set up an auto-response to applicants? A: When you are adding a job ('Add Job') there is a 'Customize auto-response' option in the 'Applications' section. This is the same section wherein you add prescreen questions and make resume optional. Simply input your desired message in that field. Q: How can I have applications from other job boards, such as Craigslist, added to the CRM? Q: How do I move my jobs from the ‘pending’ folder to live? A: Easy! Simply open up the job posting, scroll to the bottom and in the ‘advertising’ section, select the first radio button - ‘advertise on Jobing.com and career site’. Q: How can I view previously posted job postings? A: Very Simple! 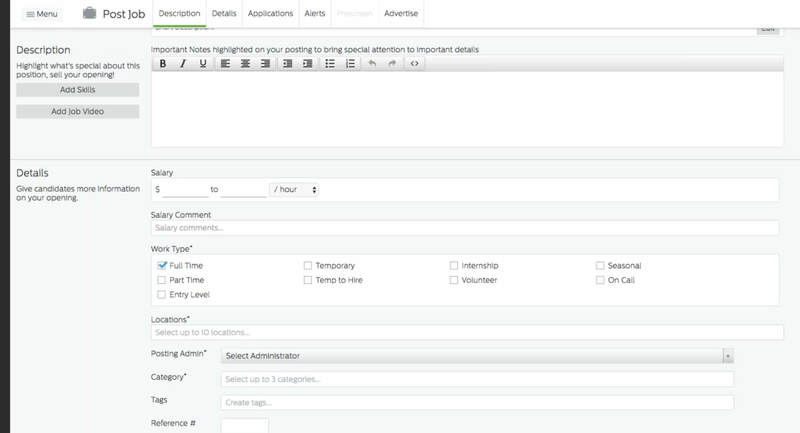 When you are on the jobs tab of the CRM, in the upper right hand corner you will see a drop down menu that states “Hide Unadvertised”, you want to ensure that “show unadvertised” is selected to see all inactive and active job postings. If you have questions outside of what is covered in this message, please reach out to Karen Wenson. We aim for 24 hour response times, Monday through Friday, pending volume. We look forward to working with the HOODZ team! Each HOODZ location is independently owned and operated. The information you provide will be submitted to the Franchisee who is solely responsible for making employment decisions for the franchised HOODZ location. HOODZ independently owned and operated franchisees are the exclusive employer for their employees and as such are solely responsible for all employment-related matters in their business. HOODZ International, LLC and its independent franchisees are equal opportunity employers committed to a diverse and inclusive workforce. Copyright © HOODZ International, LLC. All Rights Reserved.